Imagery has been a part of the everyday experience from early temple decorations to cave paintings. It intrudes into modern life to a greater extent in the form of pictures, modern art, calendars, advertising, etc. We do not inhabit only some pictures, but carefully chose images that convey some emotional and symbolic meanings. In market researches, it is relevant to use imagery in advertising and observe the effect of it on body and mind. The fight for the customer’s attention is growing competitive and in this arena, visual marketing is a highly effective method of customer brand connection. In the business world, if we want to appeal to the customers in a long-lasting way, we should get along with the saying ‘a picture is worth than a thousand words’. Making use of the images or visuals with some educational quotes or inspiring messages to convey some information is known as visual marketing. It is not about just explaining your products or brand but also involves some tools which are necessary to do it. The messages will get spread clearly and quickly depending upon the tool we are using. Consumer’ buying behavior is always persuaded by marketing and to add colors to it, try to follow the visual marketing techniques which enhance the business by identity, recall, and memory. As human beings respond more to nonverbal communication, visual communication will be an effective means of communication. It can create more engagement with a brand and its consumers. Instead of someone simply noticing an ad, we have to somehow engage them with it by clicking it or downloading the offer or doing a purchase. From the psychological surveys, it is revealed that more powerful campaigns are created by visuals, exciting our brains and get us to think. They attach something tangible to a product or brand, rather than black and white letters possibly to forget moments after we read it. We can see visual marketing all around us in the form of billboards, delivery trucks, notices, t-shirts, etc. But the whole new world of visual marketing is opened up by the internet. What is the Importance of Visual Marketing? The visual marketing is a necessary part of business campaigns in the following aspects. Many times purchases are made, based on how the visuals influence our emotions. For example, a product printed with the picture of a national flag or the pictures of famous leaders. What emotions do these pictures bring out? These images bring out much more emotions than reading out a text. Visual branding is one of the most important aspects of marketing. Many famous examples like an apple with a bite taken apart, and a logo of a multi-colored window illustrates how sharply the images will get branded into our minds. 3. Visitors on a product page who are viewing the product video are more likely to buy that product than those who are neglecting the same. The conversion rates will get more than doubled. 4. Contents in images are more likely to read by a viewer compared to the plain text contents. It will get about 94% more viewability than the others. Thereby an increase of 200-300 % can be achieved in web visits. Usage of images and photos on the social site will drastically increase the viewer’s interest in the post. Thereby one can increase the revenue on a per click base. 90% of all purchases are done subconsciously, driven by the emotional process not under the intellectual ones. For busy consumers who don’t have time to waste in researches about brands, the logo will save time. Visual cues which are combinations of color, font, graphics, texture, and depth are processed so quickly to trigger the sale. The brand should be designed carefully so that it reveals the best story about its value and customer benefits. Always start with the creation of marketing guidelines for the visual elements. These guidelines should take care of what images, graphics, and designs you are using and where they will be displayed to ensure the consistent visual cues. The guidelines must ensure the brand identity so that wherever they come across that brand always should convey the same message. If any inconsistency is there in your branding, the customer may get a negative impression about your products and services. The three ‘C’s of visual branding are consistency, creativity, and correctness. We have to share as much as information possible during the launch of a new product. But being precise in the visual campaign is very important as in the case of text marketing. Easy ways of grabbing the test worthy information always attract consumers. But many times, companies are doing big mistakes by overloading the advertisement or by providing too many information on their websites. Keep in mind the absolute requirements of the clients and then begin framing the visual content. Repetition of the messages is important but don’t overwhelm the customers. The changes in business are inevitable but they should be made cautiously. Firmly established brands will be facing more risk when they change the visual elements. Many top brands were the victims of these visual changes. Bringing too many changes in a brand will make it difficult to recognize. As from the saying, ‘what gets measured is being done’. For the performance indication of the marketing, visual elements have to be benchmarked and measured like any other elements of marketing. During a marketing campaign like advertisement or print forms, the consumers’ response should be measured by providing coupons and discounts. By doing so we can measure to which ad they are responding more. For testing engagement and response, many social media sites have incorporated built-in analytics. Even though the text-based contents are an integral part of marketing, in this digital era to set ourselves apart, visual contents must be given a pivotal role. 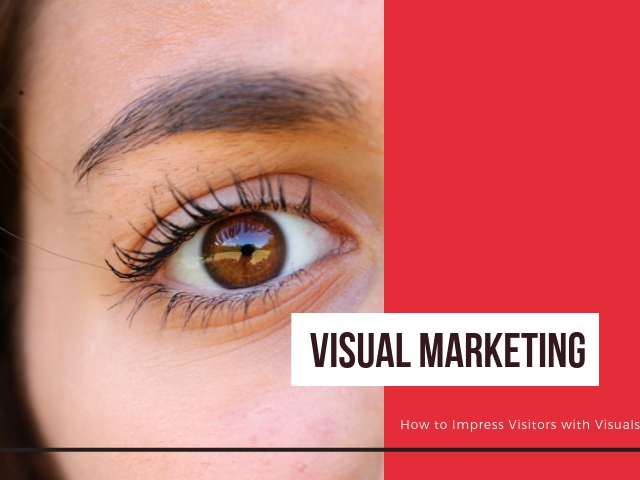 As 90% of information coming to our brain is visual and 65 % of the people are visual learners, it makes sense in making appealing visual market campaigns. We will discuss the 6 types of visual marketing strategies which will take the business to the next level. Preferably use the original images or images taken, so they always give a personal touch to the business campaign. High quality, attractive images are difficult to create, but many resources provide captivating images for free. Make sure nobody in your niche has used the same image by ensuring the authority to use them. Videos are extremely useful to provide solutions to product related problems. Conversions rates get increased by 86 % by posting videos on the landing page. As the videos are the chief representative of the brands, the videos should be of the highest caliber. The videos can be of demonstrative, how to do type, customer testimonials or animated explanatory types. Compiling all the visual data and statics into an intelligible visual display with these infographic tools. An impactful design and layout should be created by choosing the right colors, shapes, and fonts. Include the accurate and contextually relevant information. As good infographics are always on high demand amongst the bloggers, high circulation rates can be expected. Presentation slides about a firm can be shared with the world through many sharing websites. An audience can access a slide share presentation through any of their devices. A too lengthy topic which is inappropriate for infographics can be crafted as presentations. You should be consistent with fonts, borders, and colors although the presentation is too lengthy. They are very useful in backing up the claims made in the sales content. The services and functions offered by you can be shown in screenshots. The screenshots can be used to annotate a particular part of your promotional video. Screenshots can be used to capture the testimonials and customer reviews from social media platforms and industrial portals. Coca-Cola has been a trendsetter over the years in the visual content marketing space. Recently they have introduced Coca-Cola Tumblr page which is quirky, fun and interactive with a lot of animated GIFs. Inc. Magazine is one organization which made a huge success using LinkedIn. Their visual marketing contents target their wide base of an audience from a wide gamut of backgrounds-entrepreneurs, reporters, professionals/leaders, etc. who are generally active in LinkedIn. A number of appealing yet thought-provoking blogs and images are posted in regular intervals, which go viral among the followers in no time. Warby Parker is a spectacle company which has exploited the huge potential of the visual ad through Instagram contents. Striking pictures of their eye wears have been made so impeccably that any visitor, who gets to see it for the first time, would stop for a moment to take a closer look and enjoy. An online correction and proofreading tool which is especially great in developing memes which always focuses on witty and valuable ads. One mind striking example provided by them for advertising is shown above. The renowned camera maker Go Pro has grabbed the market attention with its YouTube channel which showcases daredevil stunts, wild fights, and a lot of variety of adventures, all shot with GoPros. They have managed to involve their large customer base which provides them plenty of original contents shot by their products. Starbucks, the well-known US coffee house chain has made its un-ignorable presence in numerous multiple social media platforms and made a tremendous impact by way of promoting its brand value. They have gained a full advantage of creative and innovative use of visual marketing concepts through their striking advertisements and image building posts. One interesting feature of their advertisements is subtlety- the less said, the more intriguing the content becomes. Known for stunning promotional moves, Dunkin Donuts always find itself in the top users of visual marketing. This brand hardly goes for the commonly followed direct advertising methods, instead, they promote the brand in an unusual and indirect manner. The kind of pictures put on display – colorful, rich and yummy looking products will surely drive any viewer spellbound and instantly fall in love with them. Many of their ads and pictures convey the message in a very funny way that people easily enjoy it and share it, making this self-propagating. Levo, a tool designed for job seekers and working professionals to network, has a strong presence in Pinterest. As many as 50 plus boards run the work and play, and they have even brought up several group boards and their fans pin them. The contents are shared by way of the multiple accounts they have on Pinterest. This app which has become very popular among the smartphone users worldwide has done a marvelous job in visual marketing front, by posting exceptionally impressive videos which have earned myriads of fans. These videos include a products user guide, customer comments, and many other interesting things. Seeing is believing! Nothing can be as impactful as visual contents in grabbing the attention of your targeted customers. Pictures and videos have a unique potential to engage with your audience and tempt them to explore more about your brand. Carefully designed high-quality visual marketing contents which touch the minds and sync with the pulse of the common viewer can have a long term brand building effect and can instantly push your business to new levels.